- You can now choose any image from your photo library as a new skin and it will be set as the background of the player (try it out). - Fixed a bug that caused some users to see ads in the app. I have gained a deeper respect and admiration for all our first responders. When I am unable to sleep I listen in to see how "the guys" are doing. No matter the problem they are there, always professional, never complaining, deeply involved and seemingly never weary. During these horrific fires in December 2017 I hear firefighters from all of California and also from Arizona, Oregon and elsewhere. They are well coordinated, speak the same "language" and willingly call in for their next assignment. Hours go by and they are lucky to sleep or eat. This particular fire battle is particularly grueling and unending and dangerous. I cannot say enough to thank all who are out there. You are a comfort to those of us who fear the next Santa Ana winds. God bless you all. 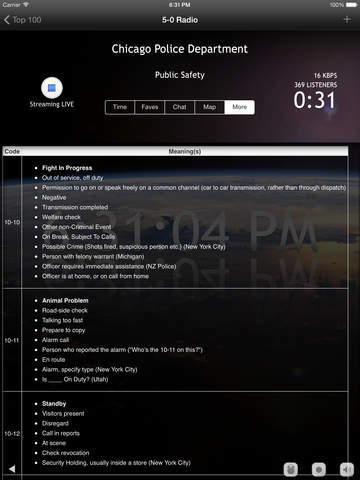 5-0 Radio Pro Truly gives me an my Family Insight of How “Sam’s “ - AKA Duty Sargents am Police Chiefs are Policing around my Home an Community ? I Now have a Much Greater Understanding of Our Local Fire , Sherrifs, Police & Ambulatory EMT’s Daily Work shifts an What they are Subjected Too on a Daily Basis ! Sure there’s Some Sour Grapes out there like We’ve Seen on TV an Social Media,But 99.9 % of Our First Responders Are Doing the Best they Can even with Hours of Over Working , an Emotionally, Mentally, & Physically Exhausted ! “God Bless You All“ for what you Chose to Do ? Still Watching & Listening at any given Time ! Been using this app for a couple months now. 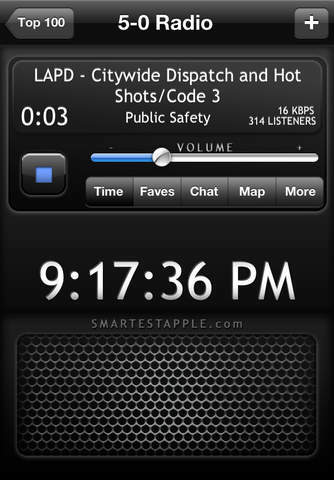 I can listen to the police activity in all major cities and even a lot of the smaller ones. Very well put together. I tried watching the news while a mass shooting was occurring and just couldn’t stand hearing the blood hungry media babbling away. Funny thing is that FB could get it better than them. Anyways I flip on the scanner to that city and bam, I am getting live updates straight from the police. The media? A joke. This? Straight talk from law enforcement themselves. 20 years ago I was listening to a local scanner, now I can listen to the exact Police Department that is investigating a burglary at one of the jobs sites my employer protects with visual monitoring. I can check the scanner 20, 40, 100 miles away. Pay the few bucks and get the pro. I really enjoy this app. There’s nothing like it. It’s the best app I I have that I can not only run my own feeds plus the broadcastify feeds. I broadcast 2 of my own private feeds and also need to check quality for a broadcastify feed. The only reason I didn’t rate it 5 stars is because I have an issue occasionally where I get double the audio. Kind of sounds like an echo. It’s usually pretty simple to fix, but still slightly annoying. ...it was great. But I upgraded to the paid version and now it’s radio silence...the unpaid actually picked up local feeds whereas the paid version claims to pick up the same feeds but I can’t ever hear what’s going on. Even when I can clearly hear the sirens going through town so I know something is wrong. Just got this a few weeks ago while watching a TV show of that was beyond eye opening. I have nephew who serves always -on or off duty, while raising a family and more close friends that are from a ll walks of life. It's been a few years since i rode along with him on a few Saturday nights. The way it was on the show about Chicago cops, I just decided to listen to some feeds. This current unrest and false blame for police always being like the criminal. I pray for all police and feel much better listening to them keep on rocking in spite of the chaos. 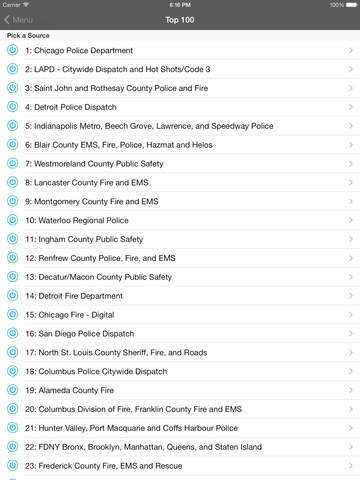 Great app as anyone can access anyplace - almost to be in touch with the never ending affirmative response ALWAYS from the patrol unit when asked to go to next call. We are blessed and need to THANK our police. It's exciting to listen to all the action and a little scary and sad to know what's happening so close to home. BUT!!!... I would have to say, the best thing about this app is the added respect and love for law enforcement it has given me. What they go through each and every day is astonishing. Firstly, the patience that these guys have far exceeds anything you'll ever hear about in social media... The daily dangerous situations they are placed in (in order to protect us) makes me want to go up and hug every single one of them and personally thank them. These are some true heroes! Side note: I do sometimes hear of some really awful, hideous, almost unbearable situations these guys are called to respond to... If you are really sensitive to these scenarios then this might not be the app for you. I have shut it down a few times when I can feel myself losing hope in humanity. I guess as with most things, balance is the key. 1.) Reported a domestic abuse in progress. After I wondered what would happen to the victim. I was in a taxi at the time so I turned the scanner on and there it was, confirmation that a squad car was responding. Made my night. 2.) Halloween, 3:00 pm, leaving restaurant after a late lunch. The traffic on Greenwich street was unbelievable, the number of first responder sirens deafening. Not far from 911 site downtown. What the heck is going on? Streets closed to traffic, people being routed away from West street eastward. Police presence at very high density for a normal day???? Turned on the scanner and became aware of events as they were unfolding before radio or tv could tell us. Reason for mayhem and confusion became clear. Chose to walk back home and stay clear. This app delivers. I recommend responsible usage of privileged information you become privy to. This app is fantastic if you enjoy listening to the activity in the "funnest" cities in the world. I live in Chicago and enjoy hearing what is going on locally. You'd be shocked at what goes on, even in the middle of the day. While the full version offers some perks, I found myself never using those most of them. The one feature that is nice is the snooze and alarm buttons. I don't have a TV so I listen to this app instead; it can be programmed to turn off at a specific time and programmed to be turned on at a specific time. Start with the free version. If you become addicted (like I am), then getting the full version might be a good way to go. The interface is easy to use and intuitive. Well done! This is a great app it helps to keep me informed and entertained. When I'm on the road it helps me to find many local feeds easily so I can see what's going on there. However, I would appreciate it greatly if they would add Cheyenne County Sidney Nebraska to list because it's a smaller town just a little under 10,000 or so but it's the headquarters of Cabela's and there's been a lot going on there with them getting bought out and there's always something going on in that town and I'd sure like to listen to that feed if it could be made available. I lived there for 10 years my visit there often. Great app and would totally recommend to a friend!